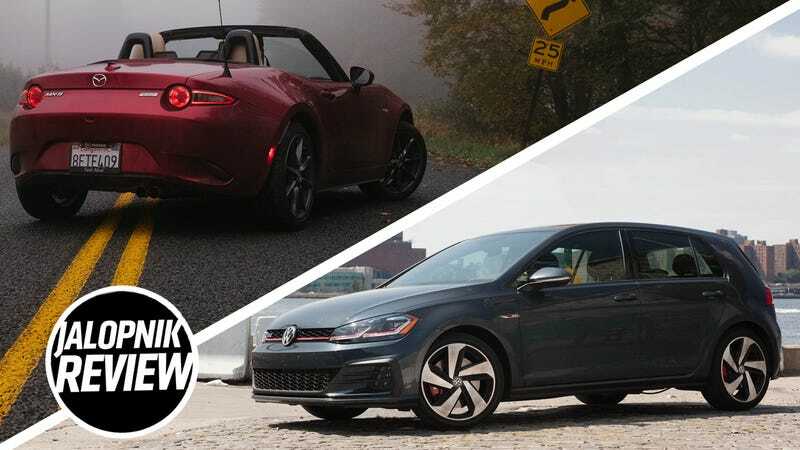 2019 Mazda Miata VS. 2018 Volkswagen Golf GTI: Which To Buy? The 2019 Mazda Miata takes an already-great, sharply styled tiny convertible and adds even more power. It’s a great buy. But the 2018 Volkswagen Golf GTI sports an updated look, has even more power and is probably the best-driving hatchback on the road without even trying too hard—but it’s not a true sports car. So if you’re looking for something fun and new for around $26,000 bucks, which one should you get? What Are We Working With, Here? The Miata and GTI are both blue-collar heroes in their own right. The Miata is a rear-wheel drive, two-seat convertible, often not taken seriously by select groups of enthusiasts and unfairly judged despite offering one of the most engaging and entertaining experiences that’s the stuff of memes and dreams, with a recent power boost from 155 horsepower to 181 HP and 151 lb-ft of torque. The GTI is a totally different approach to affordable fun—a front-wheel drive hatchback with 220 hp and 258 lb-ft of torque, with four doors and space for five who prefer a roof over their heads. But both cars have some similarities. Both are available with a manual transmission, both have power-to-weight ratios close enough to be considered similar, both start around the same price—the 2018 Miata starts at $25,730 and the 2018 Golf GTI starts at $26,415—and so both always come up anytime someone asks us which car they should buy, for whoever refuses to spend some time finding a great deal on a used car. “Should I get a Miata or a GTI?” is a way more common question than you may think, and for good reason. I’ve now driven the latest version of both, and I’m confident that I can answer this. What’s So Good About These Cars? The current ND generation of the Mazda Miata with 155 horsepower was great, but as we reported in our First Drive review of the refreshed one, 181 HP only makes a great thing better. The car is now vastly superior at highway cruising, without having to work nearly as hard to pass or keep up as it did last year. Zigzagging through foggy upstate New York roads on a cool Saturday morning feels like an ascension into heaven, if your standard for heaven is admittedly low. For me, so many modern cars feel overly dampened and vague, just a series of mostly similarly boring and softened rides trying to be everything and ending up feeling like nothing. But I’m not the first person to say the Miata is exactly the opposite of all of that. It’s attractively simple, purposeful and confident in what it delivers, and it’s packaged as a finely-tuned raw experience designed to make you feel like you’re having fun. It’s something that most automakers have pretty much given up on delivering. The Golf GTI is very similar to the Miata—it’s an experience that Volkswagen has developed and honed in on through generations, and something that can confidently sell itself almost on its reputation alone at this point. While it’s not as unique of an experience as the Miata, the GTI still carries a reputation for sharp handling, clean styling, reassuring practicality and addictive performance that has essentially defined and redefined the “hot hatchback” since it was introduced back in 1974. It’s still the standard for a competent, pragmatic and no-nonsense good time. The Miata is very straightforward in its identity, and it doesn’t have to do much to show what it’s about. You can tell just from looking at it that it’s not your everyday car. The GTI is a totally different approach, which can be an advantage over the Miata. The GTI takes a normal car and makes it exceptional. It’s much easier to see the value of the fun, flickable drive of a GTI over a normal Golf, and it immediately communicates to people that they can have fun and still be practical without calling so much attention to themselves, like they might in, say, a bright red convertible. I’m just going to tell you that both of these cars have a satisfying amount of power and torque for their size. Neither need any more or any less, they are about as perfect as could be with what they give you. I’m also going to tell you it doesn’t matter which one is faster—it’s the GTI, but it doesn’t matter because both are incredible to drive. Stop thinking about it. I would say each layout, again, suits each car. The Miata is laser focused on feeling like a sports car, so being able to turn off traction control and do a few quick attempts at getting sideways should be expected. If the Miata could not do that, it would be a problem. Meanwhile, the front-drive GTI is ultimately focused on just being a good daily driver that offers a little more for those who know what they’re looking for. It’s the mature choice out of these two. You are much less likely to intentionally get it sideways, but it’s more powerful and little quicker, and the front-wheel drive doesn’t feel punitive in any way, if being just a little less exciting when you’re looking for trouble. And then, of course, there’s the most obvious difference. One of these cars can seat five people and a load of cargo and likely put everyone involved in jail or the grave, and the other one, the GTI, can handle all of that with no problem. The Miata can feel cramped despite exposing you to the infinite nothing and everything of the sky above you and the universe beyond it. You really feel like a part of the car, which feels good for cutting through the street ahead of you, but you don’t quite feel one with the universe. The closeness of the windshield frame, the height of the doors and the perimeter of buttoned walls around you can feel a little tight, even for a guy that’s five-foot-six or whatever. It felt like wearing a car-sized helmet, which is fine if you’re a big believer in keeping your head in the game. The GTI offers a little more space for you and your bubble. Your me-space. Your area. The windshield is not angled to feel like the brim of your hat, everything stretches away from the driver at a comfortable distance and you can relax a little. It’s even got the plaid if you want it. As for infotainment systems, I preferred the Golf’s interface, which has physical buttons lining the housing of a touch screen that’s all fairly straightforward. The Miata’s dial and touch screen system wasn’t horrible, though. All common sense would advise you to get the Golf GTI. This has nothing to do with the time a grown New Yorker Man in a Cadillac glared with disdain and shook his head at me while I was sitting in the Miata, I promise. What does that guy know, anyway? A Miata could be your daily driver, for sure, just with tons of compromises. You can carry one other person and the trunk is good for a small amount of groceries or overnight bags. It’s do-able, long as you have backup plans for a lot of situations. If you are buying it as your only car, the GTI packs nearly as much fun as the Miata, but can also pack more than a weekend’s luggage and more than one additional living (or dead) being in addition to the driver. The only thing you give up over the Miata is the drop top and the ability to be a little silly with the rear end. But the point of buying a Miata is that it’s a little irrational. The Golf can feel a little too normal at times, which must be hard to accomplish with an optional stick shift and plaid seats, but it manages it. In trying to be the best everyday car possible, it doesn’t often feel exceptional, just hyper-competent. I fell just short of loving the GTI in the week I had it, but the Miata is just an entirely different level of connection. The Miata exists because it’s fun to put the roof down and feel the wind slap you around. It’s fun to slide around in a tiny car. It’s fun to shift through the gears. It’s fun to have grown men shake their head at you at a stop light like a disappointed father, because they’re too ignorant to understand how much fun you’re having. If I was worried about the creature comforts of a daily commute, squeezing every last morsel of value out of my purchase, and being prepared for everyday and likely events of my immediate future, I’d be very happy to have the GTI. The good news is it’s hard to go wrong either way.